Economic and cultural factors contribute to dog over population in Thailand’s cities, rural areas, and islands. 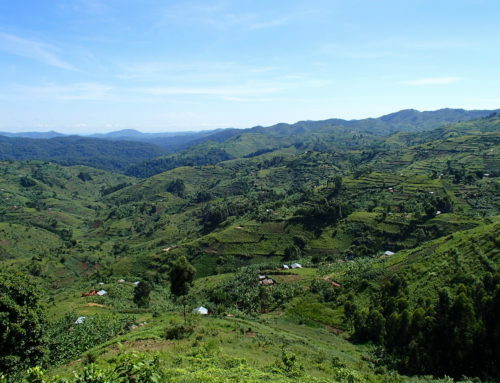 During our three week visit, we learned a bit about the challenges and people who are making a difference. As a dog-lover and rescue group volunteer, I always notice dogs when I travel. It is really tough to see stray dogs in need of food, medical care, and TLC. 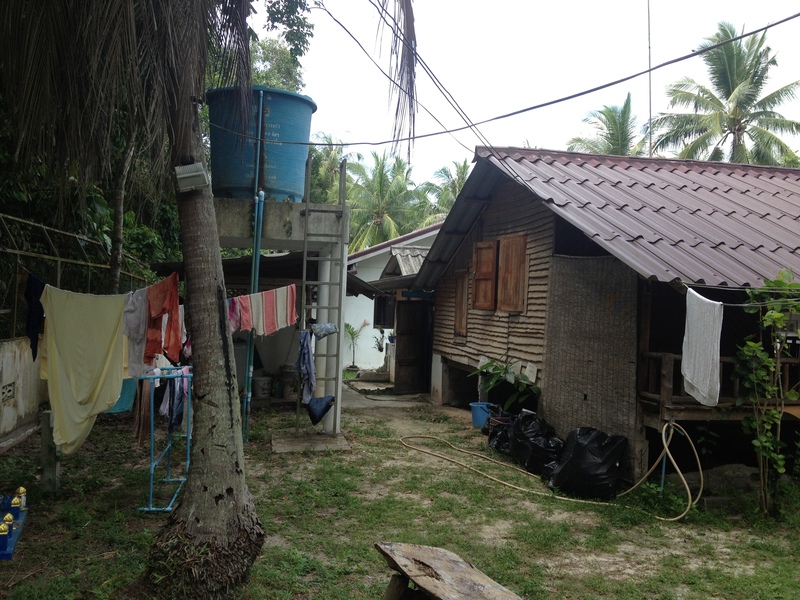 In Thailand we saw the challenges of dog overpopulation and the mistreatment of owned animals. But we also discovered the efforts of some special people who are committed to providing care and achieving positive change. At our next stop, northern Thailand, we started to see more strays. In the town of Chiang Sean, a small pack seems to have claimed one small temple ruin as their home. 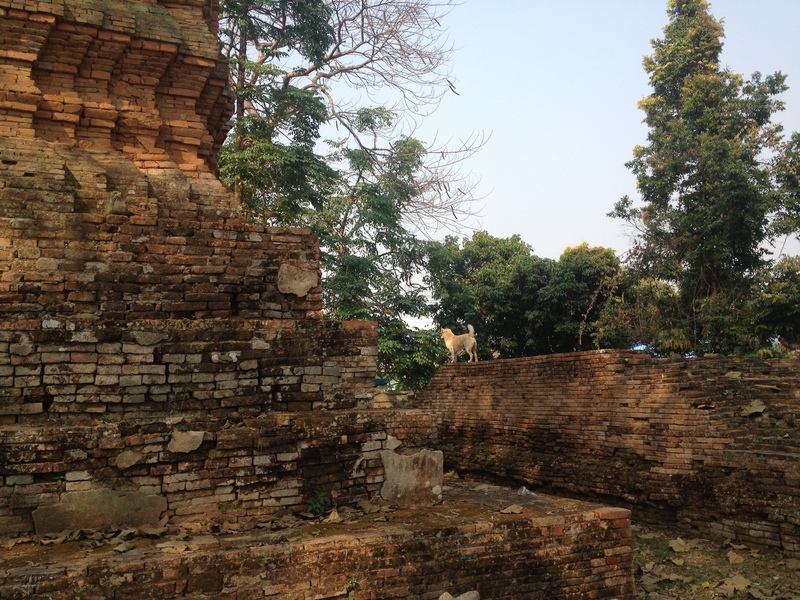 One watched us walk around, another barked at us, and another took a pee pee on the temple wall. 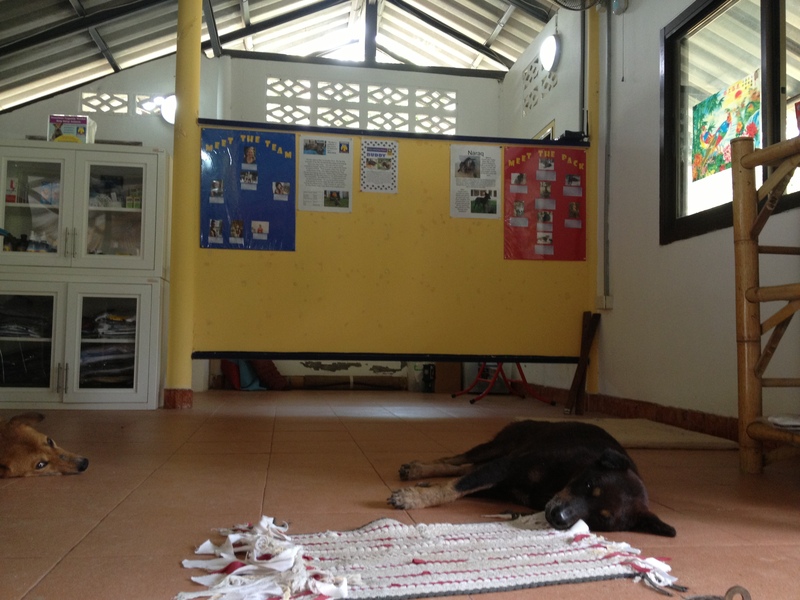 In Chiang Mai, we walked by a small coffee shop run by Animal Rescue Kingdom (The Ark). It was evening and the shop was closed, so I checked out the website and sent an email to ask their hours (I never got a reply). We stopped by the next day, but they were still closed. The Ark is a 9-acre sanctuary that takes in street dogs and provides food and medical care, while seeking permanent homes. There is a video on their website and the place looks really cool. It would have been great to visit, but we never heard back. While doing research for this post, I saw that the founder and director, Grant Waldman, died from cancer in late February. The last destination we visited in Thailand was the island of Koh Phangan, and it was here that we learned a great deal. 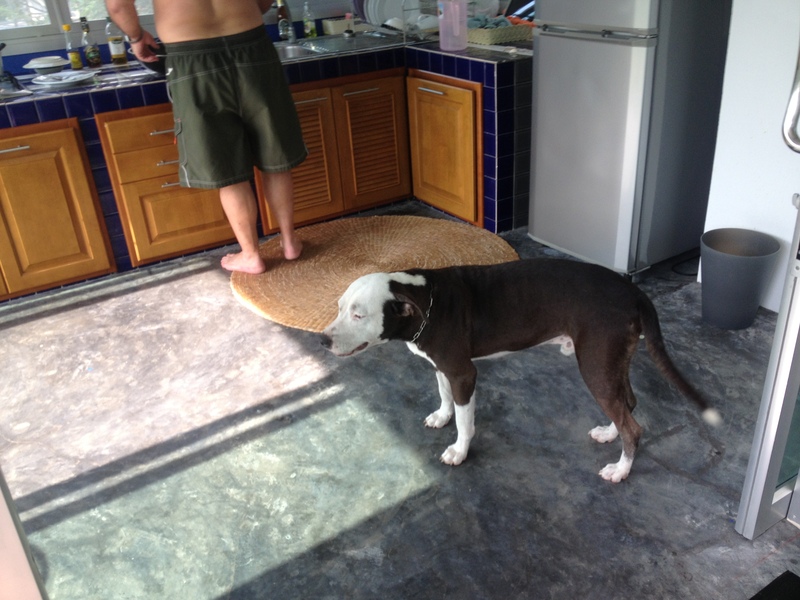 A few minutes after we checked into the hotel and went to the beach, I met Sandy, a beautiful pit-bull with a chain collar (I didn’t know his name, so I called him Sandy). As we strolled down the beach, I saw many dogs running and playing – some had collars, some didn’t; some looked healthy, some didn’t. We frequented the beach bar at the hotel next door, Phangan Beach Resort, where Adam, the bartender, told us a lot about the beach dogs in the area. The hotel staff has ‘adopted’ two dogs, Rocky and Jade, and they all chip in to provide food and medical care. Rocky is a full-of-life lover boy and Jade is shy until she knows you. I often watched them running and playing on the beach. The hotel staff told us that Sandy has an owner who does not treat him well. One time, he was injured and the owner did not provide medical care. 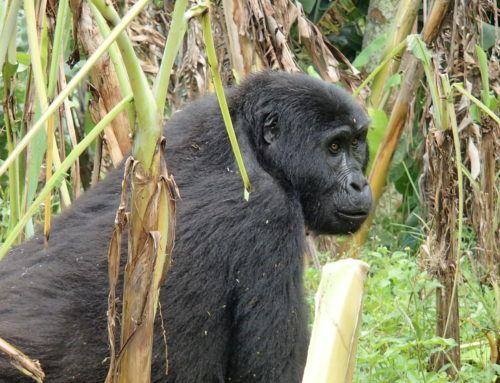 We saw him regularly – during the day he often slept on the beach under some large trees. At night, he popped by our flat to say hi when we were cooking dinner (we gave him a treat every day). I saw the people in the flat next door feed him several times; they also kept a water bowl on the patio. I felt so sad for this sweetie, but it was good to know that there were people out there who were looking out for him to some degree. Adam told us that people often give food and water to some of the stray beach dogs, but not all. In a little tourist guidebook, I saw an ad for an animal organization, Phangan Animal Care (PAC), so I checked out the website. I was impressed with their work, so I left a note on their Facebook page. They replied and invited us to stop by, so we did. 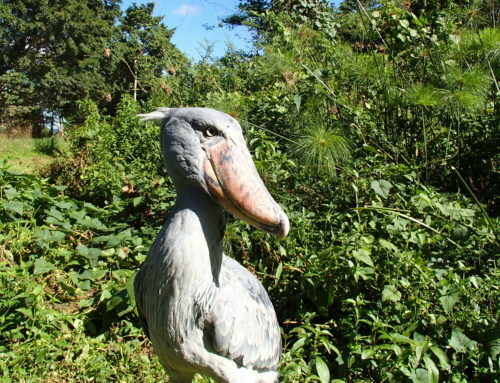 On a quiet rural road, away from the town and beach scene, we found Phangan Animal Care. Practice Manager, Laura Taylor, gave us a tour, told us about the organization, and answered our many questions. We also met two of the three dogs she has adopted; one was regularly abused by her former owner and no longer trusts other humans. 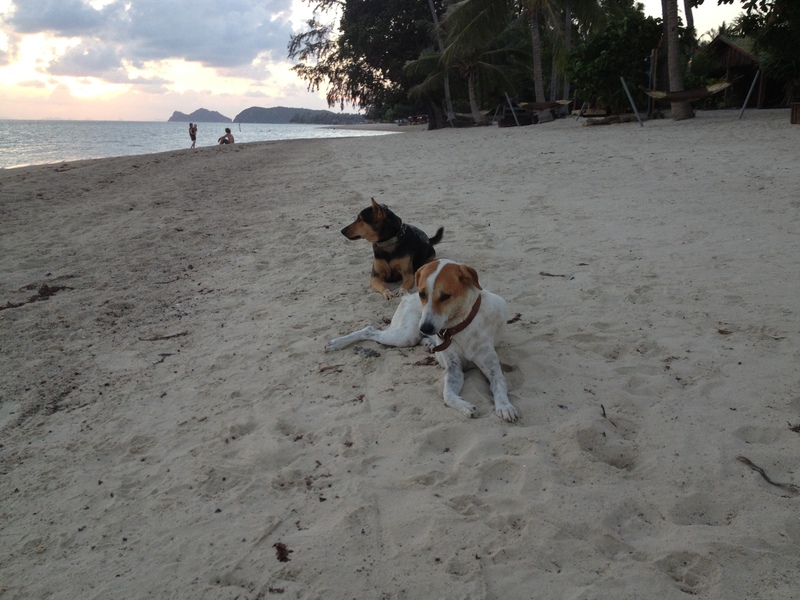 When Shevaun Gallwey created Phangan Animal Care in 2001 there were no animal care facilities on Koh Phangan. The organization’s focus is to provide medical care and rabies vaccines to the island’s strays, along with education for the public. They also run a successful spay/neuter program island wide to control the population. See more about PAC’s work. The staff treats dogs and cats at their facility and in the streets / at the beach. 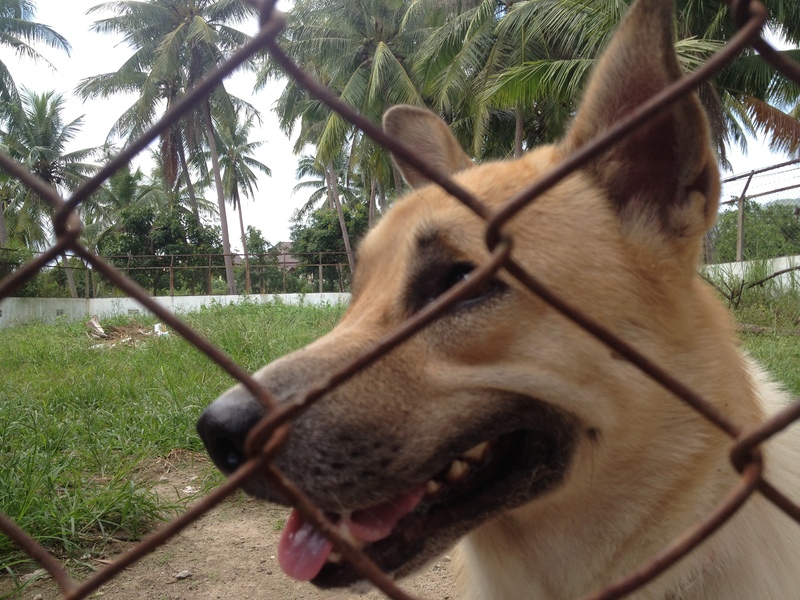 When a dog is brought to Phangan Animal Care, they also perform spay/neuter surgery when funding permits. 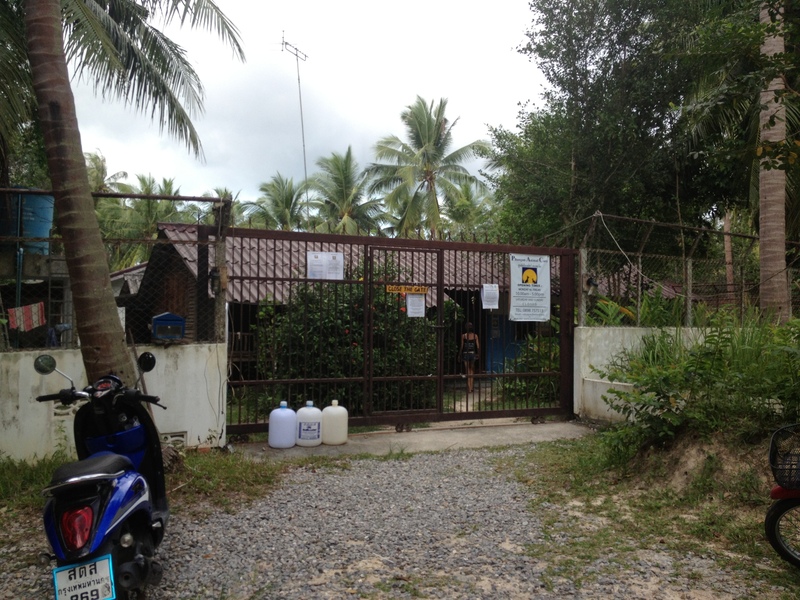 At this time, there is no data on the number of strays on the island, but Phangan Animal Care plans to conduct research as soon as they have the people resources. Laura also educated us about how Thai people view dogs and their relationships with them. There are many owners who take very good care of their dogs, but won’t do spay/neuter as in Buddhism this is believed to be tampering with the dog it is not our right to do this. If the dog has puppies, the owner will rarely see them as their responsibility and will not care for the puppies. 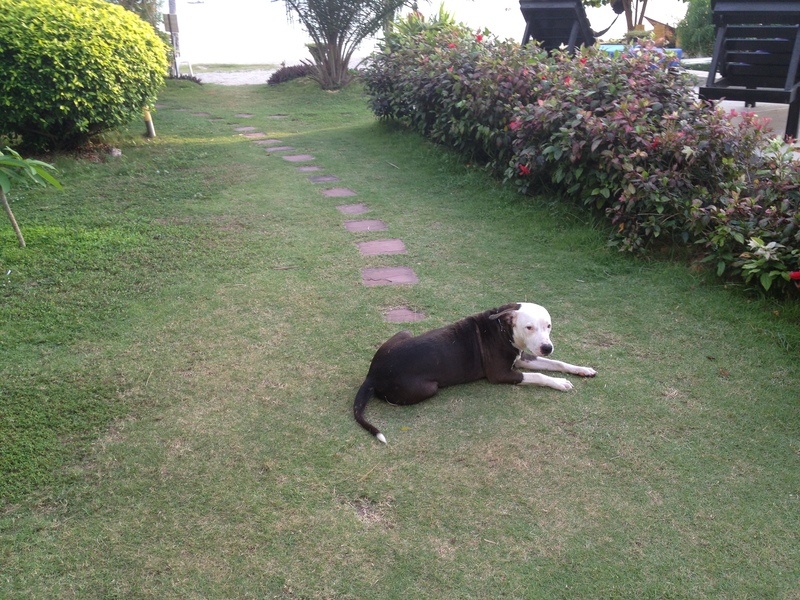 Some people will give food and shelter to the purebreds but few give to the mutts as it is the common belief that mutts were bad people in their past life and this is why they have been born as soi dogs. Some bring unwanted dogs to the temples so that the monks will care for them. Phangan Animal Care is proud of all that they have accomplished, despite their limited resources (staff and funding). Through ongoing communication with the temples, they recently formed a partnership with Koh Phangan’s head monk to create a public service message. The monk will appear on posters that promote responsible pet ownership and care. Phangan Animal Care still has many needs for funding, a full time on-site veterinarian, and long-term volunteers. If you would like to help, you can make a one-time or recurring donation on their website through PayPal or follow them on Facebook to help spread the word about their work. 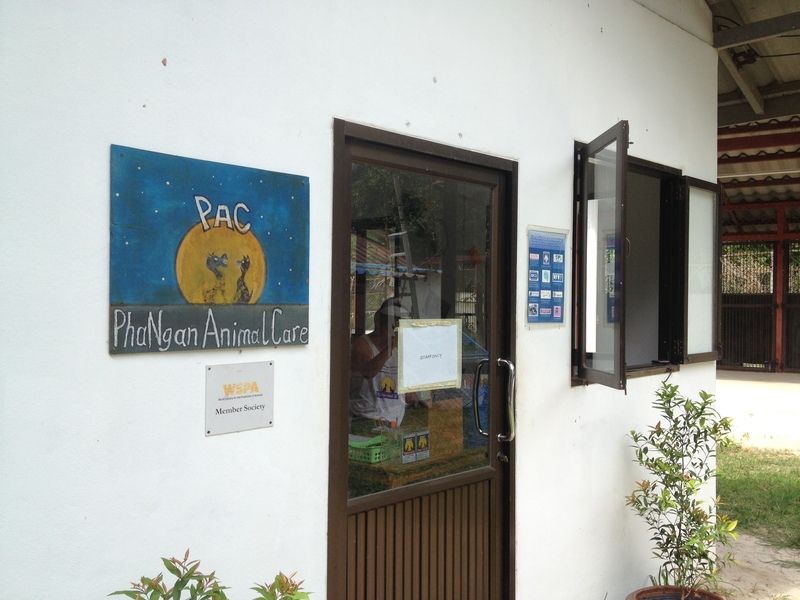 See a blog post by Saibh about her experience volunteering at Phangan Animal Care in the summer of 2015 – Helping Out at Phangan Animal Care >.